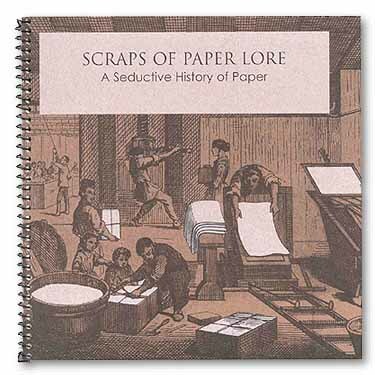 Scraps of Paper Lore: "SCRAPS" is a compilation of many of the stories, strange, intriguing, humorous, and even surprising, that Harold Alexander has encountered during his travels, research and conversations with papermakers throughout the world. $15.00 U.S. per copy plus postage. Please email marge@maralex.com for more information. MN residents add $1.10 sales tax and $3.00 for book rate or $4.00 for 1st class postage and handling. U.S. residents add $3.00 for book rate or $4.00 for 1st class postage. International residents $4.00 for surface or $7.50 for airmail. Discount orders are available for orders over ten books. this book fills that need." $25.00 U.S. per copy plus postage. Limited amount available please email. marge@maralex.com for more information. MN residents add $1.75 sales tax and $5.00 for book rate or $7.00 for 1st class postage and handling. U.S. residents add $5.00 for book rate or $7.00 for 1st class postage. Canadian residents add $7.00 for airmail postage and handling. International residents add $14.00 for airmail postage and handling.